UPDATED: Focal launches its £299 XS Book desktop speaker system | What Hi-Fi? Focal has released further details of its XS Book desktop music system, which officially goes on sale in the UK this month for £299 a pair. The compact XS Book has the "linearity of a small monitor with a maximum sound pressure level of 96dB SPL at one metre", says Focal. One of the secrets of the speakers' performance is said to be the vented port with a complex shape that has been modellled by CAD to "minimise airflow noise and maximise efficacy". A single multi-function knob controls volume as well as standby/power. As standard the speakers come with a 3.5mm cable to connect them to a computer or other source, and a 1.5 metre RCA cable (plus 1.5m extension cable) to connect the two speakers together. A carrier bag and taller stand are options, and the XS Book is compatible with the Omnimount AB2 standard to allow easy wall mounting if required. We first spotted these rather cute looking speakers, designed for desktop use with a PC or laptop, in the Focal room at this year's Manchester Home Entertainment Show. 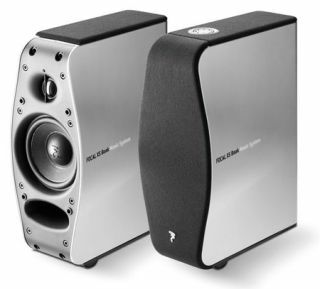 Called the XS Book Music System, Focal – which recently merged with Naim – describes it as "the ultimate computer 2.0 system, and a true mini monitor". The speakers could also be used to boost the sound of a flatscreen TV or as an active music system in a small room. The 'master' right speaker houses a 2 x 20W amplifier, a 3.5mm stereo jack, volume control and on/standby switch. There are also RCA inputs for connecting the left-hand 'slave' speaker to the right-hand 'master'. Each speaker has a 10cm Polyglass mid/bass driver and a 19mm aluminium tweeter. Focal hopes the XS Book system will go on sale in the UK soon through its independent dealer network for "less than £300". The company has also revealed details of its Little Bird, Bird and Super Bird 2.1 systems which combine an integrated amplifier/subwoofer with a pair of Bird satellite speakers. There's an optional iTransmitter Kleer dongle for wireless streaming of music from iPhones/iPads/iPods. The systems are expected to go on sale in the UK soon with prices from roughly £700 to £1000.